Let’s leave the technical details for last. First, we need to understand why anyone would want to install one of these systems to begin with. Active solar water heating systems are suited to any climate and almost any kind of house. Some homeowners fear that a solar energy system won’t be able to keep up on cloudy or rainy days, but that’s just not the case. Germany is notorious for rainy and cloudy weather all year-round. Yet they are one of the world’s leaders in solar energy. The savings you can get from a solar water heater are tremendous. It’s estimated that they can decrease your heating bill by 50% to 80%. Even in areas of the country that receive less sunlight, the savings are still substantially better than what other water heaters can provide. You can anticipate a huge reduction in the amount of pollution you’re producing. Not only are you saving non-renewable fuels for other appliances or devices, but a solar water heater will reduce CO2 emissions by half. 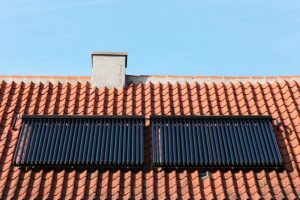 What Kinds of Solar Water Heaters Are There? Direct Circulation: These systems circulate household water through roof collectors and into a storage tank. Since those roof collectors are outside, however, they are susceptible to freezing over in colder climates. They’re ideal for states like Florida. Indirect Circulation: For climates less like Florida and that are prone to colder temperatures, indirect circulation is better. These systems work almost just like direct circulation systems, but they incorporate a non-freezing heat-transfer fluid to heat the water and keep it warm. These systems are less efficient than active systems, but in exchange, they’re less expensive, require little maintenance, and often last longer. You’ll find yourself not needing solar water heater repair in Naples, FL nearly as often with one of these systems. What’s Needed to Install One? Nothing more than a trustworthy HVAC technician who is well-versed in installing solar-powered devices. They can help you estimate costs, find the right size for the system, and go through all the work of making sure it’s all installed properly and according to codes and regulations. A solar water heater is a great system for first-time solar energy users. Contact Bruno Total Home Performance today to learn how to get started!